Just a quick pic of the tank redo taken with my phone. More to come when I find my camera. Sorry for the glaring white stones, they were fast buy at wallmart to separate separate areas of the foreground plants for now until I get some rocks at the beach. I like it -- very nice DM! Thanks! Finally have pressurized co2 also after yrs of wanting it. Traded the dwarf sags at left front for Brazilian microswords. Ill post the plant list once I'm home. Its hodgepodge for now to see what plants do well and will suit the final escape. So far the angel, otos and corys are enjoying the change! A friend will have a krib pair to give in about a month looking forward to it! Co2 definitely makes a difference with plant growth. How are you feeling about the maintenance? Sorry didn't see this till now. Already had to remove the frostbit to give light. To the rubin sword. Hairgrass spreading. Have to trim and move some plants. Even call nevelli has 4 new leaves. The vals have shed the nasty algae. Better powerhead going in tonight. Koralia nano. Ill snap another pic shortly. I'm at the coffee shop on my phone. Gotta love Wi-Fi! Did some trimming, shifting (not done yet) and for the first time ever, photo cropping to save your eyes. No more algae on the plants, specifically the vals which was the worst. The driftwood will need some attention. Had to move most of the frogbit out as it was shading the plants too much. Decided on PPS-PRO fert strategy. Drop checker still not installed. I have 4dk solution, going to cut to 2dk with distilled water so the fluid turns green at 15ppm co2. My ph test reagent doesn't have b blue in it, will get an API low range. Love it DaMossMan! Wish I could plant my new tank and have a theme. But money is extremely tight and my bottom feeders aren't having it. Love to see other folks get it done though. Thanks Babelfish and Kelly ! The tank is shaping up. Meet the new 3 young silver angels and discus (2 carnation turquoise, 2 leopard) If the angels cause problem for the discus, I'll have to rehome them. Trying NOT to envision a 20g long LOL. NOT !!! 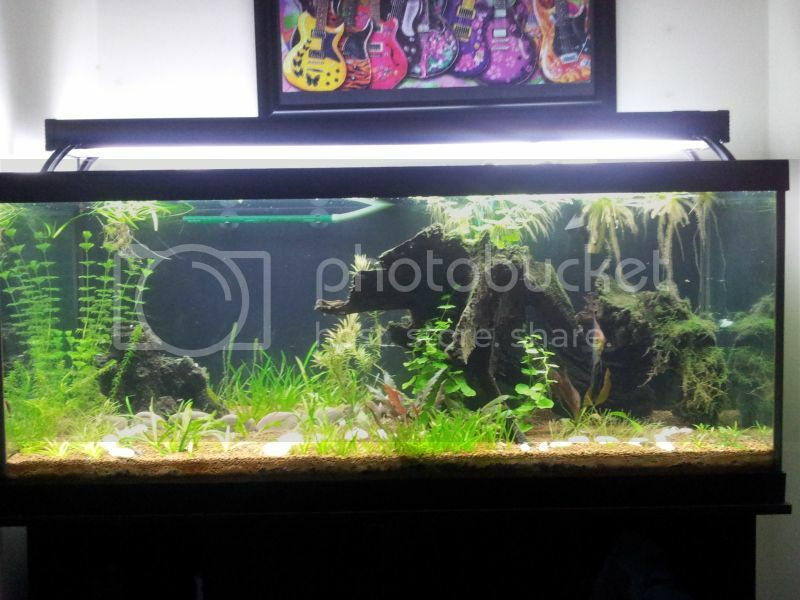 The tanks shaping up & I was able to spread out the dwarf hairgrass. The white stones were removed, a few darker ones replaced them. Still some cyano on the wood. Can't seem to rid of it. Don't want to dose enthromycin if I can help it. Maybe remove the wood, manually remove what I can and a bleach dip ? The tank is really looking nice! levels between 10&20 as it tends to grow in areas of poor nitrate levels. I'm not sure I'd try to bleach it out of existance. Bleaching driftwood can be tricky and nearly impossible to eliminate the bleach from the wood after treatment. Thanks Frank! How've you been? appear and then drop off, at worst the tank will have to completely recycle. an airstone flowing upward past that affected area. Increasing the overall O2 level will help. Thanks much Frank and congrats on your retirement !! Old lights create a reduced light spectrum that cyano and algae favor. - Found old tank logs and realized the tubes were over 2 yrs old ! T5ho should be replaced at approx the 8 month mark. You can prob go a year with them, 2+ yrs no ! Color me stupid. Stuff done tues and wed night. Removed the driftwood, scrubbed well, rinsed. Cleaned the glass tops and tank top. Inspected the filter intake and spraybar. Cleaned the spraybar. A bit of bba still on the wood but looks dead. No visible cyano either. Crossing my fingers ! To Do: Filter service (rinse filter media with tankwater). Hey Da, fingers crossed you got the cyno, that stuffs nasty! I fought with it for what felt like ages in one of my tanks, I did finally have to dose ethryomiacyn. A spot came back where it was easily toothbrushed off. I may get EM just so have it in stock in case I ever have to do the nuke/blackout method. But yes, it's a last resort ! 6 Otocinclus cocama - zebra otos ! that makes 7. Both are plants I've wanted for ages. To make the otos feel at home I've added some blackwater extract. Just enough for the tank to take on a bit of tea color. Peat will be added to the filter soon. Sorry for no pics in awhile. Doing my 'year end' round of stuff which is declutting the apt, sorting computer files and paperwork and completing other projects. I need to get a newer car and anything helps so i'll be having an electronics and music equip sale. Some plants are doing too good, a couple are not. Time for a big trim as well as a filter maintenance and water change. The trim will provide enough cuttings to fill the quarantine tank. I'll get a pic in before and after the trim. Yah, seems like planted tanks are kind of like relatives' children. and they've grown a foot or more! Are you going to put the trimmings back in the other tank?